The experience begins with the box, where a steel hanger with cool logo keeps the lid in place. Sensual by nature. The essence of life. Refined features. Transformed energy. Dynamic existence. Yeah, they offer hot air-gas background in Nokia Land. Rarely has a phone felt so damn nice in the hand as the Nokia 8800 Sirocco. The first thing you notice about the phone is the weight. 138 grams is heavy for a phone. and with the exception of the upper fifth part the 8800 has a clean design of glass and steel. On the other hand, there is not much to get on the feature page. Scirocco has a tasteful and discreet color theme, but is the same as other Nokia Series 40 mobiles that would normally be found cheap segment. In return included two batteries pretty board charger, a great bluetooth headset and a pouch in a very genuine leather. And finally you also get exclusive ringtones composed by Brian Eno – besides Roxy Music and work with Talking Heads, U2 and David Bowie also have Windows 95 “startup sound” on their consciences. Then connaisseurs blinking in agreement with each other when Eno kimer in the VIP lounge. 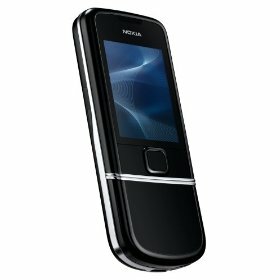 The buttons on the Nokia 8800 are small enough for long SMS messages, but not nearly as difficult to operate as the large flat fields on Samsung SHG D830. And the only problem in daily use is the “joystick”, which consists of a square ring around a central “select” button. On the music side the Finns have spoiled us with something of a rarity when it comes to Nokia mobiles the stereo Bluetooth A2DP. On the other hand, it could only get to 128 megabytes (shared) memory, so in reality it is just about 20 songs in the collection. Scaleability filed under “wishful thinking”. The only “advanced” mode we managed to coax out of the Scirocco was the synchronization of the phone book over Zyb (zyb.com) – which worked smoothly. The image quality from the built-in 2 megapixel camera is nothing to brag about. The images are blue-cold in bad quality. And grynede .3 gp videos in 176×144 pixel resolution is not something that actually satisfies the user. But overall, we must nonetheless admit Nokia 8800 Scirocco is one of the better mobile phones. For we live in a world where fancy functionality is superfluous distracting and real performance is measured with heart. Scirocco has this certain character.